When a preschooler discovers a favorite book, you can be sure you'll be reading it again and again. Giving a picture book isn't enough... also give the promise that you'll read it and enjoy it together! Here are some of my favorite preschool picture books to read aloud. Bark, George by Jules Feiffer. When's George's mother asks him to bark (as any young pup should be able to do), he emits meows, oinks, and moos! Something must be terribly wrong! Silly George's inability to bark and a surprise e nding will have preschoolers laughing out loud. 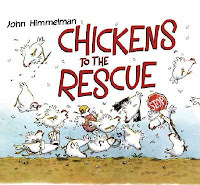 Chickens to the Rescue by John Himmelman. Every time something goes wrong on the Greenstock farm, guess who arrives to save the day? Really detailed, silly illustrations demand to be pored over again and again. A Hat for Minerva Louise by Janet Morgan Stoeke. Silly chicken Minerva Louise goes looking for a hat to keep her warm all winter. Being Minerva Louise, she finds many things, but none of them are hats. Children love to pore over these books and laugh at the silly mistakes Minerva Louise makes. Mrs. McNosh Hangs Up Her Wash by Sarah Weeks. Mrs. McNosh is doing the weekly laundry and hanging up all her clothes. But once she gets started hanging things up, she can't stop! She hangs up the phone, the newspaper, and even the mailman! This one has all the kids chuckling during storytime. Leonardo the Terrible Monster by Mo Willems. Leonardo is a terrible monster. Sounds scary, right? Well, not exactly. Leonardo is a terrible monster. Meaning that he does a terrible job at being a monster: he can't scare anybody! Humorous illustrations, humorous text... you really can't go wrong with giving Mo Willems this holiday season. 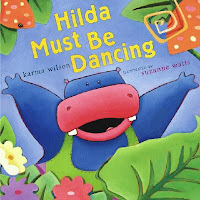 Hilda Must Be Dancing by Karma Wilson. Every time the jungle floor begins to thump and bump, all the animals know that Hilda the hippo must be dancing. Although they implore her to pick up a quieter hobby, nothing makes Hilda happier than dancing! Great rhymes and lots of great words make Hilda great for developing early literacy. Plus, it's fun to read!